The public transportation system in Atlanta is called MARTA. 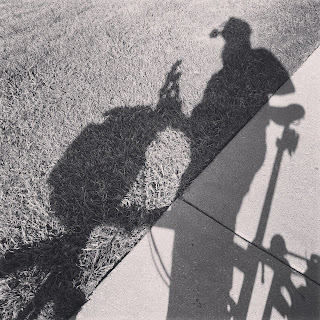 My commute is multi-modal, part of which is riding the MARTA. 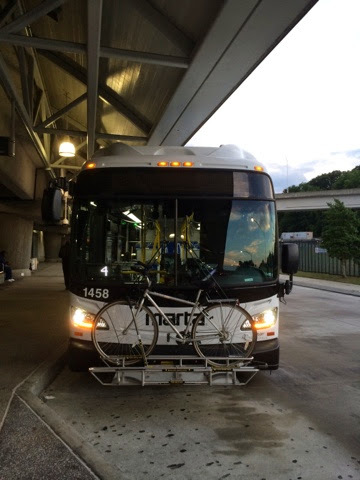 Recently, MARTA has replaced some of the older buses with really nice, new buses. I know they have replaced the buses for routes 185 and 85. I take bus number 85 to get to work and back. The new buses have many fancy amenities, including very nice seats and lots of room for luggage and folding bikes (key!). I have not used the bike rack, ever since, St. Louis. While I like to see the option on the bus, I am so glad I have a folding bicycle, which I can take inside the bus. The bike rack can only accommodate two bicycles. When you get to the bus or when the bus gets to you, if there is no room in the rack and you don't have a folding bike, you are out of luck. You may have to wait about 30 minutes or so, for the next one. But, irrespective of how many bikes can fit in the bike rack on the bus, the new buses are a fun to ride. I say they better be, given they cost about $300K a pop.